If you’ve been following my Instagram posts then you probably already know the answer. 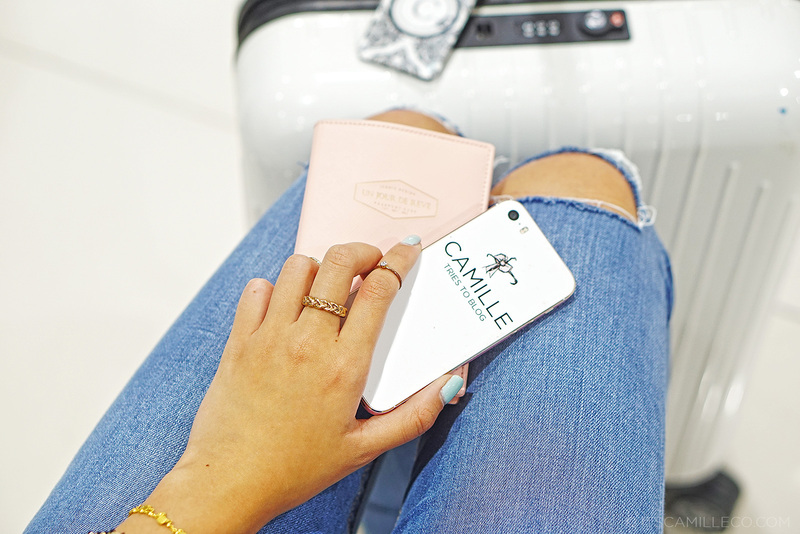 Before June ended, I, along with my blogger besties, flew to the beautiful country of South Korea. FINALLY, I got to see my motherland! LOL, just kidding. Seriously speaking though, it’s no secret that I’ve always wanted to see South Korea. That’s a pretty obvious fact given the extreme excitement plastered all over my giggly face. This is why when AirAsia Zest, together with the Korea Tourism Office, offered to arrange this trip for me, I was ecstatic! I did have a few reservations though. To be honest, I’m not really big on low-cost carriers. My mom is super paranoid so she has always warned me about them. I’m sure a lot of you share the same sentiments and that’s perfectly understandable. So before I said yes to this trip, I told AirAsia my concerns and they were kind enough to explain a few things to me. You see, I only blog about brands and products that I believe in so arming myself with information about them is vital. So what made me say yes to AirAsia Zest? I asked everything from company background to booking and check-in procedures to even their pilots and planes! I was more than satisfied with what I learned. For those who don’t know, AirAsia Zest is the Philippine leg of AirAsia, having partnered with Zest Air last March 2013. AirAsia is the leading and largest low-cost carrier in Asia, with over 88 destinations. It was named the World’s Best Low Cost Airline at the annual World Airline Survey by Skytrax for 5 consecutive years from 2009-2013 and the World’s Leading Low Cost Airline at the 2013 World Travel Awards. Over 220 million guests have flown with them and I’m now one of them. Booking and check-in was a breeze. AirAsia Zest is committed to making traveling easier for its guests so there are plenty of ways to book and check-in. Guests can make bookings through AirAsia.com, AirAsia mobile phone app, authorized travel agents, travel service centers located in SM MOA and SM North EDSA and cash payment partners like 7 Eleven, Robinsons Departments Stores, Bayad Center, Cebuana Lhullier and more for online reservations without credit/debit cards. If you want to avoid long lines at the check-in counter, you can check-in online as well via AirAsia.com or the AirAsia mobile app 14 days to an hour before departure. I personally prefer the mobile app because I find it to be the most convenient. Come day of departure, I was pleasantly surprised with the size and look of AirAsia Zest’s aircraft. It felt new and clean! I expected it to have little legroom but it’s actually quite spacious, even more spacious than some of the more expensive airlines that I’ve flown with (I’m so tempted to name names). Service was lovely and our flight was smooth. I tried AirAsia Zest’s inflight meal as well to last me through the almost-4 hour flight from Manila to Incheon, and it was pretty good. I got the pasta arrabiata. If you want to order an inflight meal like mine, I suggest you pre-book it online to save 20% off. You can also pre-book your baggage and get 60% off. I’m glad I gave AirAsia Zest a chance because now, I can travel to Korea more affordably. If you want to fly to Korea as well, AirAsia Zest offers flights to Incheon and Busan from Manila, Cebu and Kalibo. 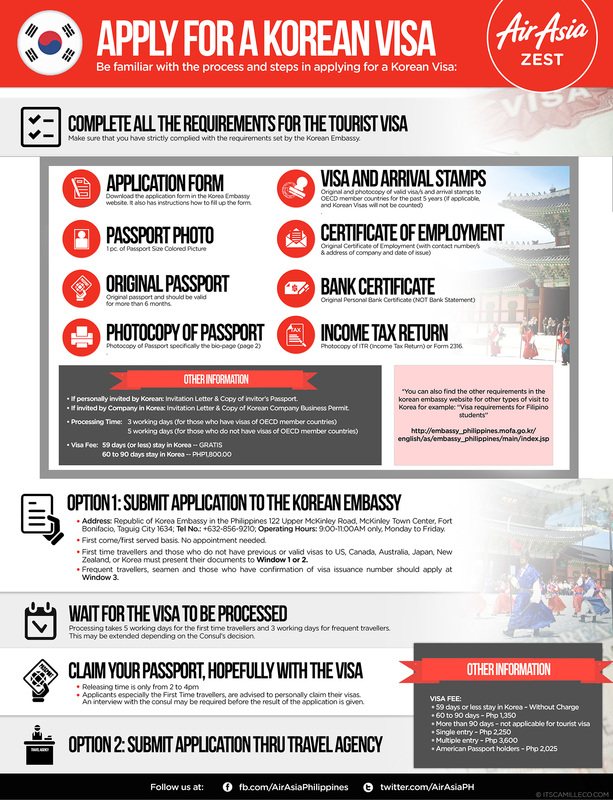 Make sure you get your Korean visa ready before you fly! Here’s a helpful infographic for you to follow. Follow AirAsiaPhilippines on Facebook and Twitter for updates and promos. Tomorrow, my travel diaries from Korea begin! Thanks for your info about the airline. Im also paranoid about lcc airlines esp that I travel with little ones :-) but with your recommendations maybe I should give aa a chance. Thanks again! This was from waaaaay back so I wouldn’t know how it is now. But based on my experience, it was all good! Hmmm depends on what you’re looking for in an airline. Are you looking for a budget airline? Which destination are you going to? No visa fee for less than 59 days? How much should my bank account have (show money)? Oh got it! :) Thanks! cool!!!!!!!!!!!!!! :> sana nga I can go there ssoooon! I am so looking forward on your next posts about your visit in Korea! Did you feel fit in right away? We just flew Air Asia in Thailand and were very impressed! It didn’t feel like a low-cost carrier at all, and our flights were perfectly comfortable and on time. Right? My thoughts exactly! :) I felt the same way! The pants is from Bershka? Super nice!! Been wanting to have one like that! Ah I love your hat! Where is it from? Oh wow you went to Korea!!! I was wondering Ate Camille kung gagawa ka ng blog post regarding your birthday dinner nung April. I’m just curious kasi eh. At least kahit hindi ako nakapunta I have photos to see. Hehehe. Yes! you’re starting your Korea posts! I’m so excited hahahaha :))Ughhh still on the petition for a Korea trip as grad gift huhu hope my parents would allow tho huhu. Safe trip,loving your travel outfit. Thank you Chiamaka! Comfort all the way! Yes more travel diaries coming! Meron pa! :) Cut to Korea lang muna for now :) I wish we can travel forever! Hi, where did you get your top and pants? Thanks!